(Alfred A. Knopf, April 29, 2014 / $35) powerfully brings to life the struggles, triumphs, and transformations of Dietrich Bonhoeffer—German pastor, dissident, and conspirator in the resistance against Hitler and the Nazi party. In the decades since his execution in Flossenburg concentration camp in 1945, Bonhoeffer has become the most widely read Protestant thinker of the twentieth century. His life and legacy have inspired millions toward greater involvement in the urgent needs of the world, and he has become a hero to Christians of all denominations—evangelical and mainline Protestant, traditionalist and liberal Catholics—as well as to non-Christians. No other theologian has crossed as many boundaries as Bonhoeffer while remaining exuberantly, generously Christian. In this biography, Charles Marsh draws on extensive new research to present a definitive account, both majestic and intimate, of Bonhoeffer and an incomparably authoritative reading of his work. Marsh transforms our understanding of the pivotal moments of Bonhoeffer’s formation, including his first visit to America from 1930-31, when he interacted with social reformers, Harlem churchmen, and public intellectuals. This visit set the stage for Bonhoeffer’s denouncement of the Nuremburg laws upon his return to Germany and his dangerously vocal support of the Jews and other victims of the Nazis, as he struggled in vain to fight the Reich’s takeover of the German church. Undaunted, he would continue conspiring against the regime until his arrest, and he would continue producing his luminous theological reflections virtually until his execution at the age of 39. 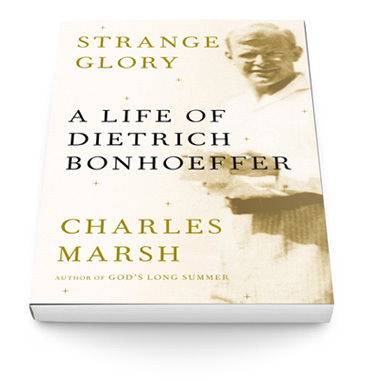 Strange glory examines the full complexity of Bonhoeffer for the first time. With a keen understanding of his multifaceted writings—often misunderstood—as well as the imperfect man behind the saintly image, Marsh has put forward a nuanced, exhilarating, and often heartrending portrait that lays bare Bonhoeffer’s flaws and inner torment, as well as the friendships and the faith that sustained and finally redeemed him. Strange glory is a momentous account of a modern icon whose work offers a much-needed guide for navigating the religious and political confusions of our own time. Charles Marsh is a professor of religious studies at the University of Virginia and director of the Project on Lived Theology. He is the author of seven previous books, including God’s Long Summer: Stories of Faith and Civil Rights, which won the 1998 Grawemeyer Award in Religion. Of Marsh’s earlier volumes Reclaiming Bonhoeffer, the late Eberhand Bethge, Bonhoeffer’s closest friend and first biographer, wrote: “This book is a theological sensation—an exciting event. Nobody who attempts to define Bonhoeffer’s legacy today will able to ignore Marsh’s book.” Marsh was a recipient of a Guggenheim fellowship in 2009 and the 2010 Ellen Maria Gorrissen Berlin Prize fellowship at the American Academy in Berlin. He lives in Charlottesville, Virginia and is available for interviews. To follow Charles on Amazon, click here. 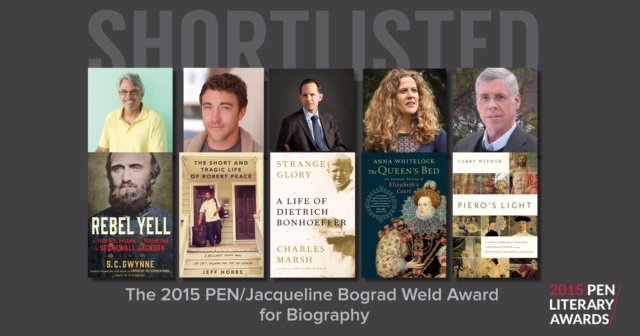 For a selection of Strange Glory reviews, click here. To read an interview with Charles Marsh about Strange Glory, published by the Boisi Center for Religion and American Public Life at Boston College, click here. "one of the revelations of Strange Glory, Charles Marsh’s new biography, is how Bonhoeffer managed to combine mortal earnestness about faith with a talent for enjoying life in this world."